The Holy Apostle Bartholomew was born at Cana of Galilee and was one of the Twelve Apostles of Christ. After the Descent of the Holy Spirit on the Day of Pentecost, it fell by lot to the holy Apostles Bartholomew and Philip (November 14) to preach the Gospel in Syria and Asia Minor. In their preaching they wandered through various cities, and then met up again. Accompanying the holy Apostle Philip was his sister, the holy virgin St Mariamnne. Traversing the cities of Syria and Myzia, they underwent much hardship and tribulations, they were stoned and they were locked up in prison. In one of the villages they met up with the Apostle John the Theologian, and together they set off to Phrygia. In the city of Hieropolis by the power of their prayers they destroyed an enormous viper, which the pagans worshipped as a god. The holy Apostles Bartholomew and Philip with his sister confirmed their preaching with many miracles. At Hieropolis there lived a man by the name of Stachys, who had been blind for 40 years. When he received healing, he then believed in Christ and was baptized. News of this spread throughout the city, and a multitude of the people thronged to the house where the apostles were staying. The sick and those beset by demons were released from their infirmities, and many were baptized. The city prefect gave orders to arrest the preachers and throw them in prison, and to burn down the house of Stachys. At the trial pagan priests came forth with the complaint that the strangers were turning people away from the worship of the ancestral gods. Thinking that perhaps some sort of magic power was hidden away in the clothes of the apostles, the prefect gave orders to strip them. But St Mariamne became like a fiery torch before their eyes, and none dared touch her. They sentenced the saints to death. The Apostle Philip was crucified upside down. Suddenly there was an earthquake, and a fissure in the earth swallowed up the prefect of the city, together with the pagan priests and many of the people. Others took fright and rushed to take down the apostles from the crosses. Since the Apostle Bartholomew had not been suspended very high, they soon managed to take him down. The Apostle Philip, however, had died. After making Stachys Bishop of Hieropolis, the Apostle Bartholomew and St Mariamne left the city and moved on. Preaching the Word of God, Mariamne arrived in Lykaonia, where she peacefully died (February 17). The Apostle Bartholomew went to India, where he translated the Gospel of Matthew into their language, and he converted many pagans to Christ. He also visited Greater Armenia (the country between the River Kura and the upper stretches of the Tigrus and Euphrates Rivers), where he worked many miracles and healed the daughter of King Polymios from the demons afflicting her. In gratitude, the king sent gifts to the apostle, who refused to accept them, saying that he sought only the salvation of the souls of mankind. Then Polymios together with his wife, daughter, and many of those close to them accepted Baptism. And people from more than ten cities of Greater Armenia followed their example. But through the intrigues of the pagan priests, the Apostle Bartholomew was seized by the king’s brother Astiagus in the city of Alban (now the city of Baku), and crucified upside down. But even from the cross he did not cease to proclaim the good news about Christ the Savior. Finally, on orders from Astiagus, they flayed the skin from the Apostle Bartholomew and cut off his head. Believers placed his relics in a leaden coffin and buried him. In about the year 508 the holy relics of the Apostle Bartholomew were transferred to Mesopotamia, to the city of Dara. When the Persians seized the city in 574, Christians took the relics of the Apostle Bartholomew with them when they fled to the shores of the Black Sea. But since the enemy overtook them there, they were compelled to leave the coffin behind, and the pagans threw it into the sea. By the power of God the coffin miraculously arrived on the island of Lipari. In the ninth century, after the taking of the island by the Arabs, the holy relics were transferred to the Neapolitan city of Beneventum in Italy, and in the tenth century part of the relics were transferred to Rome. The holy Apostle Bartholomew is mentioned in the Life of St Joseph the Hymnographer (April 4). Having received from a certain man part of the relics of the Apostle Bartholomew, St Joseph conveyed them to his own monastery near Constantinople, and he built a church in the name of the Apostle Bartholomew, placing in it a portion of the relics. St Joseph ardently desired to compose hymns of praise in honor of the saint, and he fervently besought God to grant him the ability to do so. On the Feast day in memory of the Apostle Bartholomew, St Joseph saw him at the altar. He beckoned to Joseph and took the holy Gospel from the altar table and pressed it to his bosom with the words, “May the Lord bless you, and may your song delight the whole world.” And from that time St Joseph began to write hymns and canons to adorn not only the Feast day of the Apostle Bartholomew, but also the Feast days of many other saints, composing about 300 canons in all. 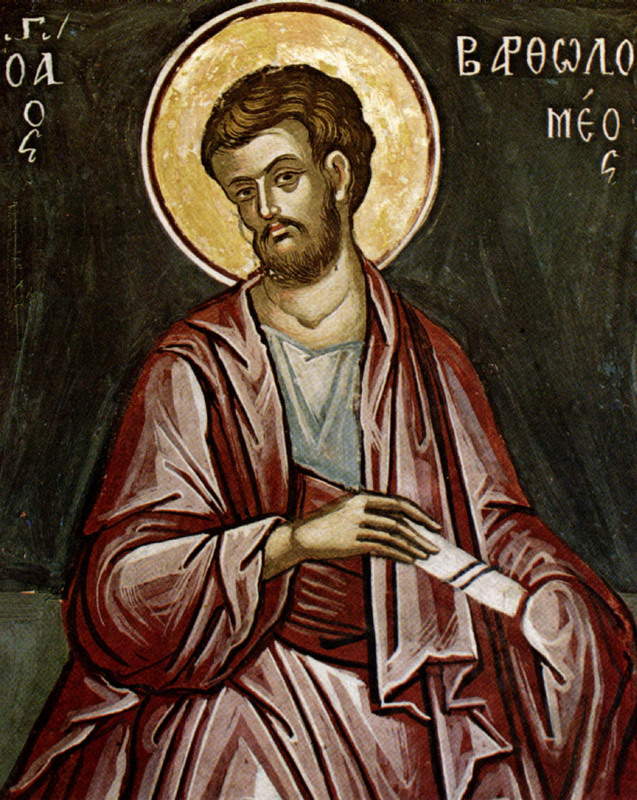 Sts John Chrysostom, Cyril of Alexandria, Epiphanius of Cyprus and certain other teachers of the Church regard the Apostle Bartholomew as being the same person as Nathanael (John 1:45-51, 21:2). Holy Apostles Bartholomew and Barnabas, / entreat the merciful God / to grant our souls forgiveness of transgressions. You have appeared to the universe as a great sun, / shining with the radiance of your teachings and awesome miracles. / You enlighten those who honor you, apostle of the Lord, Bartholomew.